Glad you made it home safe and sound! This dish looks delicious, and how great that you had everything at home, ready to go! Glad you made it home safey. 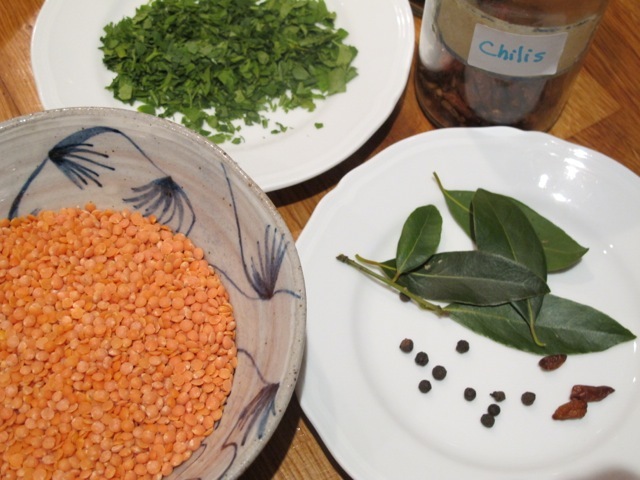 Am I adding the lentils when I add the stock? Yes and thank you, Tunnza! Thanks–see above for lame excuse! on March 26, 2014 at 7:49 pm | Reply Dianne P.
Good recipe idea, Robin! All I need are the peppercorns, and this’ll suit us well on Friday for Lent. (No meat!) Lent-ils for Lent! Thank you for this wonderful recipe. 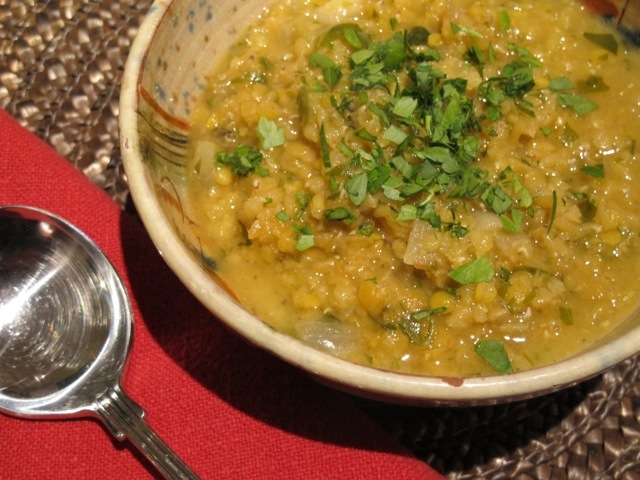 Just looking at the picture “Red Lentil Soup” makes me smile…I just know how delicious it is. So glad you are both home safe and sound. Glad you made it home safely. This has become one of my go-to recipes from you as well. Hey, Robin! Vegetable “sock” cubes made for an interesting visual… Cheers! Oh dear–I bring in jet lag as my excuse! Oh, my! Able to cook while battling jet lag! Here in NYC, we send out for Chinese. I was held up at Heathrow for an hour once as they searched my carry on for something or other. It turned out be a needle which escaped from my tiny emergency sewing kit. The guard confiscated it and then tried to hand me a bunch of papers to fill out so I could reclaim it once I got back to the USA! I had the exact same experience at Heathrow when it came time to board my connecting flight to Toulouse! My bag was flagged for a bottle of water in the carry on. I was 4th in line for a search and they were making last call for the flight. It was stressful to say the least. Happy to see a post on your blog. I need something quick and delicious for the weekend. Healthy eating for life finally arrived from Amazon. Love it – a wonderful collection of your recipes. Welcome home, Robin and Meredith, after a very tiring round about in USA. It’s no small matter nor effort to be at a different place every other day and speak to forever changing new faces… You both deserve a rest and a peaceful time among all the members of your family. Perfect arrive home solution, Robin. Love to you both and hope to catch up with you in August! Amazed that you could put together any kind of meal at all after such a long & tiring journey following a whirlwind trip! Hope you can get plenty of sleep – and sunlight – to recover gradually. Always look forward to your posts – and a peek at life in France with Robin and Meredith. Thanks, Nancy–I’ll check it out, sounds wonderful. Welcome home both of you we no that these checks need to be done but why oh why do they always take so long. Fish and chips not so available here, Elaine! Glad you both made it home safely. I hope the cats are still talking to you! Hello! So glad to have met both u and ur wife last Sunday at Eataly! What an adventure that place was and meeting u was so exciting that I felt like a little school girl. You were both so charming, sweet and genuinely kind that I wish we could have spent more time with u both. But all in all it was wonderful and thx so much for signing all of my Robin Ellis possessions! (Prized possecssions) glad to know u r safely back at home and already back to cooking. Amazing!!! I love lentil soup! It’s a major staple in our home since I was a little girl! I remember sitting in the kitchen with my mother sifting through the lentils looking for little stones and with every find I would yell out with such pride “I found one!! !” And my mother would say “Very good now keep up the good work!” And I did with so much happiness and pride. Till this day when I’m making lentil soup and sifting through them looking for stones I still remember my mothers telling me very good as I would whisper to myself “I found one!” She was a wonderful lady and my best friend. Well hope all is well in beautiful Lautrec. Stay well! P.s. My husband John sends his best regards as well! It was a pleasure for us too, Georgene to meet you in the craziness of Eataly! Lovely story of how you and your mother searched for teeth cracking stones in the lentils. We are slowly “coming to” after our adventure and have wonderful memories of the trip to wake up to.